On April 17, 2012, I departed the Pack Creek Campground, taking U.S. Highway 191 North. After a two-mile drive, I stopped in the parking lot of the Gearheads Outdoor Store, at 471 South Main Street. 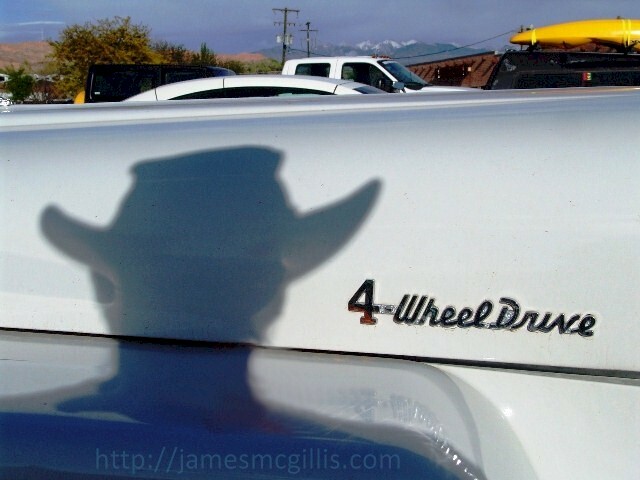 There, in the parking lot I saw the shadow of the Other, examining an old white Jeep pickup truck. As I approached the little truck, I could see that its frost-white and pale green paintjob was new. With a bed full of patio furniture, this was a work truck, not a show truck. To me, it looked similar to the Jeeps and Jeepsters that I remember from the early 1950s. Below the chrome, 4-Wheel Drive logo, bits of Moab’s red dirt clung to the body. 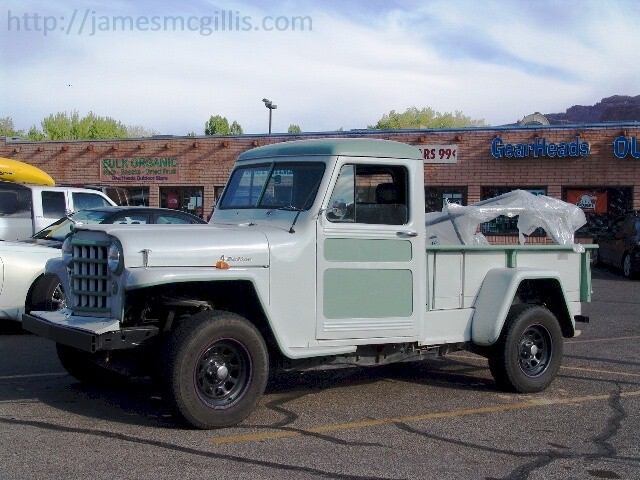 During an extensive internet search, I found other examples of Willys Jeep pickup trucks. The front end of a 1950 model that I found was identical, right down to the eight-by-four grill opening. 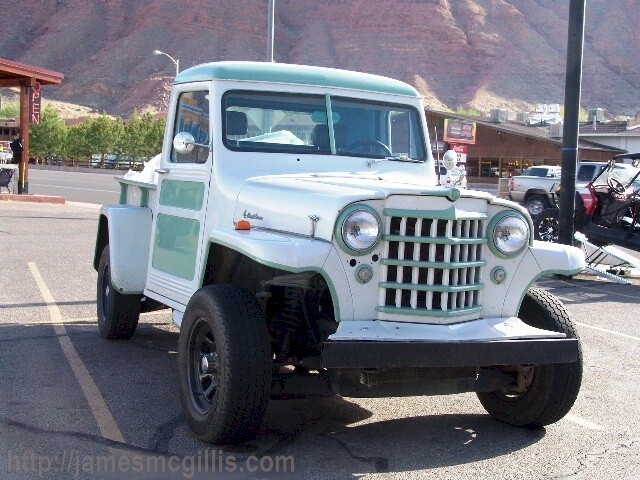 While standing there, I decided that this classic model Jeep Truck was where it belonged – in Downtown Moab, Utah. After admiring the vehicle, I jumped back into my own truck and headed for Downtown Moab. After parking on Main Street, near the Moab Information Center, I walked across the street and entered the Back of Beyond Books. For the past several years, I have provided the hardware and the remote internet server for a Moab Books live webcam, installed at the back of the shop. Today, it was time for a webcam tune-up, which consists mostly of blowing a lot of red Moab dust out of the computer fans. Next time you are in Moab, be sure to visit the Antiquarian Section, at the back of the bookstore. In my experience, it is the best source for Moab, and Colorado Plateau antique books anywhere. Spending an hour in the Antiquarian Section is like a baptism in the Grand River, or its later incarnation, which is the Colorado River. While you are in the store, look up and locate the small flashing red light. Every ten seconds, that webcam transmits a digital image of the bookstore to the worldwide web. Once you locate the webcam, it is acceptable to make faces or even to smile at the camera. Just remember that there are over 600 million Chinese online now and most of them are probably watching you as you make a fool out of yourself. Before you leave, please tell the staff that the webcam brought you in that day. At the rear of the store, I went into the staff area, which is off-limits to customers. My approved plan was to blow the dust from the computer, adjust the camera, check its timer and be back on the road as soon as possible. In front of those café doors, the customer sees the results of careful book selection by Andy Nettell and his capable staff. Behind those swinging doors, I found the spirit that makes Back of Beyond Books such a special place. Rumor has it that many years ago the Monkey Wrench Gang met in the back room of the bookstore. “Back of Beyond”, itself is a reference to their mythical hiding place. From there, this country’s proto eco-terrorists planned their sometimes mythical and sometimes actual plots. On the other hand, was the gang’s association with that particular backroom just a story in itself? Soon, I would have more clues than I could process. As I looked up from my dusty work, Kokopelli appeared above me. His multicolored blush told me he was up to something. As I stood up, I could see that he had found an old sign, which he had propped up on a nearby laptop computer. As I read the words printed on the sign, a chill ran up my spine. 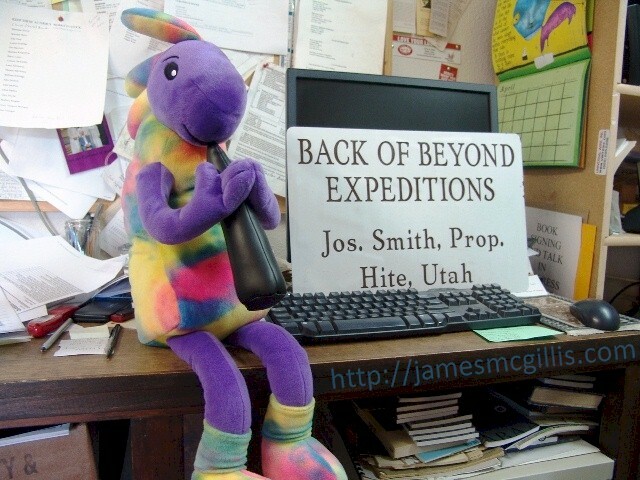 The magnetic decal sign read, “Back of Beyond Expeditions, Jos. Smith Prop., Hite, Utah”. Had Kokopelli stepped into another Edward Abbey time warp? On the sign, I saw the name, occupation and locale of the fictional character, “Seldom Seen Smith”. Edward Abbey featured Seldom Seen Smith in his classic novel, The Monkey Wrench Gang. While looking at the sign, I wondered if Smith might indeed be a real person. After a clandestine meeting in that backroom, perhaps he had rushed out the back door, leaving the famed magnetic sign behind. Then, from behind me, I sensed that two piercing blue eyes were staring at me. Turning to look, I saw a watercolor painting that captured the feeling of the redrocks around Moab. 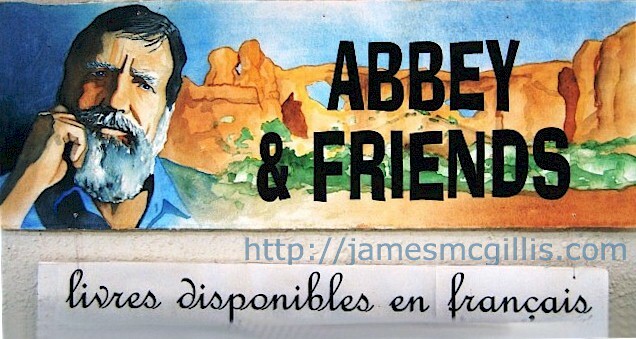 Standing before the Arches he sought to protect, was the Bard of Moab himself, Edward Abbey. Displayed next to his intense, if not worried countenance were the words, “Abbey & Friends”. Below that was the French phrase, “Livres Disponibles en Francais”. While looking straight into my soul, Abbey silently, yet dispassionately said; “You are going to do the right thing, aren’t you?” It was more of a statement than a question. I almost blurted out, “Yes, of course I will”, but somehow I managed to remain silent. Years before, I had asked the Spirit of Edward Abbey to accompany me to Sunset Campground at Navajo National Monument. 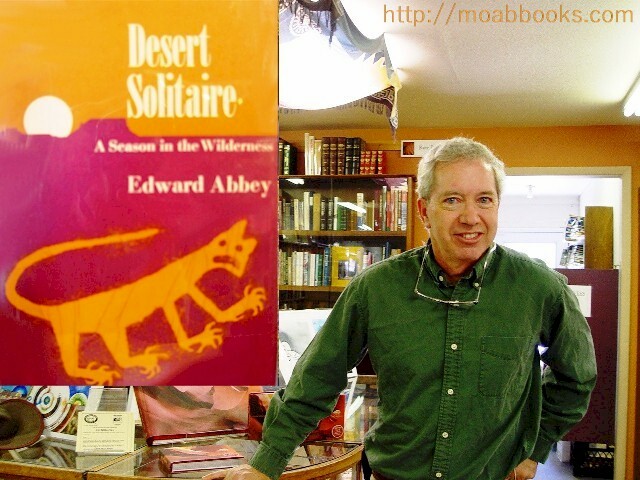 In his first classic book, Desert Solitaire, Edward Abbey had decried the supposed destruction of the monument in the late 1950s. At that time, the federal government paved the access road and upgraded the campground to contemporary standards. In spirit, he could see that not all the changes to his own personal “Back of Beyond” were harmful. If visitors could not access and enjoy these sacred places, his spirit realized, there would be no one ready to defend them from future harm. Now, from his perch in the backroom of Back of Beyond Books, Edward Abbey still had the power to startle visitors and readers alike. By the time I left the bookstore, Kokopelli had already reappeared on a bench outside. 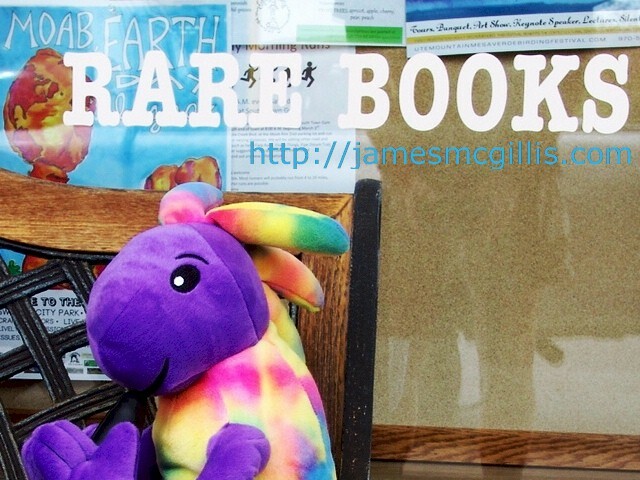 Behind him, window signage advertised “Rare Books” and “Moab Earth Day”. For me, it felt good to take a deep breath then a walk across town that afternoon. I remembered purchasing a Signet Paperback First Edition of Jack Kerouac’s “On the Road” novel at the old ABC & Beyond Bookstore, which once occupied a storefront across the street. I headed toward that shop to see what paperback treasures they might have on hand for me that day. For only two dollars, I found a small book that contained all of the “Utah place names”. While walking back to my truck, I spotted another interesting Jeep pickup truck. This one was easier to identify than the 1950’s era Willys pickup I had seen earlier that day. After later searching the term “Jeep CJ Truck”, I found this Jeep truck with ease. With its removable half-cab and longer wheelbase, this was a red 1981 – 1984 Jeep CJ-8 Scrambler, 2-door pickup truck. During its four year production run, Jeep sold less than 28,000 CJ-8 trucks. With its special wheels, red & white paintjob and taped graphics, the Jeep looked almost original. Only a pair of lift-brackets beneath the front bumper indicated that this CJ-8 now ran with a higher ground clearance. As I drove back to the Pack Creek Campground late that afternoon, I paused to think about the day’s activities. 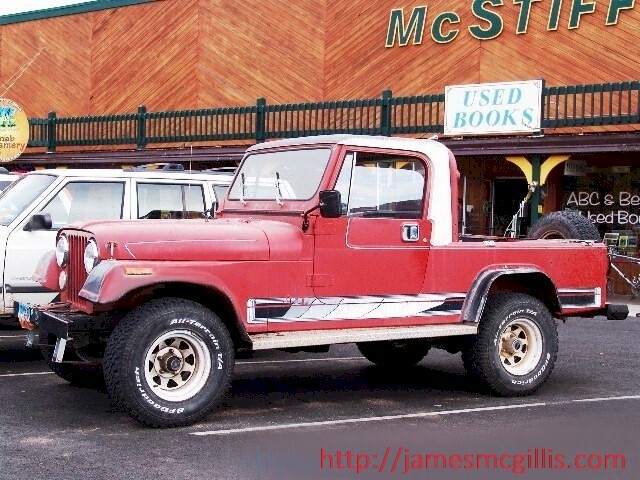 I had seen two classic Moab 4-Wheelers, updated the Back of Beyond Books webcam and discovered clues to the onetime whereabouts of the Monkey Wrench Gang. In all of that time, I had seen only one other human being – Edward Abbey, or was it the Spirit of Edward Abbey? A visitor never knows what they will see or who they will meet in Downtown Moab, Utah.